It has been a week since my last nail art post and it was completely unintentional. I had a serious cut on my left index finger and it was rather painful when pressured is applied. I couldn't even apply nail polish properly. My bad. But I am back and I am very excited to share with you the 3rd installment to my 2014 Halloween nail art series! I am particularly proud of this one because it took me a longer time than usual to be able to do this. 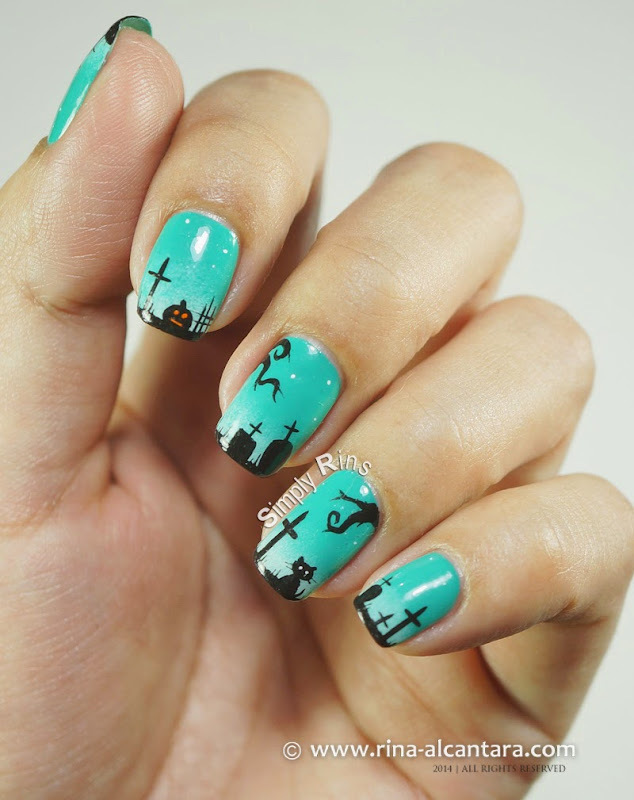 I called it "Graveyard, Too" just because I already made a nail design of the same theme last year that I simply named, Graveyard. I did it a little different this time. It is clearly a unconventional color to use for Halloween but I think it worked. It's a good kind of different, don't you think? I first intended to use lime for the background but decided on this one instead. I actually did one nail first just to see if it would be okay and if the color would fit. I used 2 nail polishes to create this nail design. Both are from Deborah Lippmann -- She Drives Me Crazy and Flowers in Her Hair. This is 2 coats of the former for base color and I used the latter for a subtle gradient on the tips using a make-up sponge. I needed the lighter color to add some lighting effect so that the graveyard would pop from the background... and for some effect as well. Clearly my left hand is more feminine as I failed to take a more art-y shot of my dominant hand. As for the nail design, I used acrylic paints, a liner nail art brush, and another for details. This was done freehand and it was quite a challenge because I wanted to paint smaller details compared to last year's version. Painting the trees were particularly hard for me as I meant them to be a little spooky by making the branches more curvy. One of my weaknesses is painting curve lines. 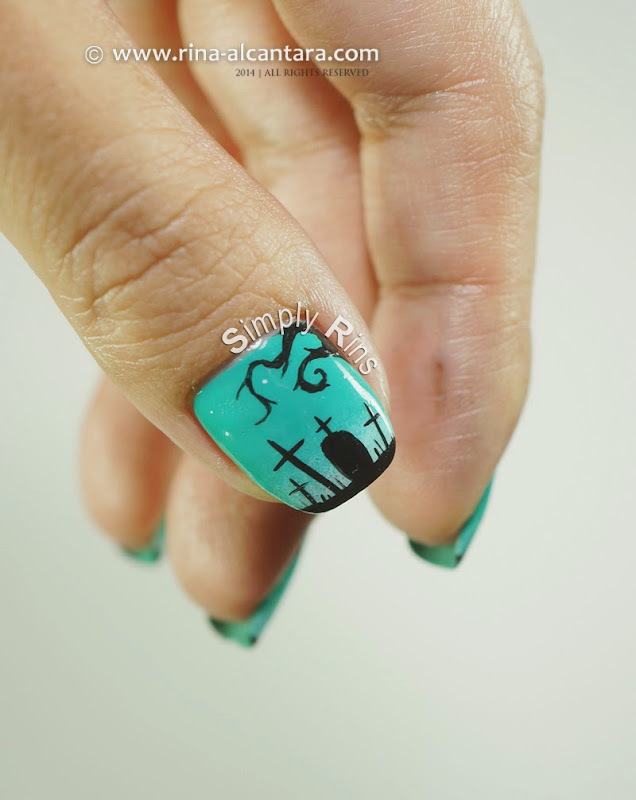 There are 2 highlights in this graveyard nail art, the cat and the pumpkin. I had the most fun painting these 2. Well, I had to draw a cat in honor of Floozie (my beloved cat) and the pumpkin was too irresistible not to paint because I wanted a pattern breaker. And I think it was cool to have some traditional Halloween color incorporated somewhere in this design. I admit that this nail art is somewhat selfish in a way that in order to appreciate it, you have to look at it closer. So it would be difficult for other people to appreciate it unless they see it up close. But I really don't mind because this really gave me a worthwhile satisfaction to be able to paint tiny details such as these. Deborah Lippmann nail lacquers are available in Rustan's The Beauty Source and retails for Php795 each. For other details, login to their Facebook Page -- www.facebook.com/RustansTheBeautySource -- and follow them on Instagram -- @rustansthebeautystore.